Industrial Wireless 101: Which wireless antenna do I need? In our continuing quest to understand industrial wireless, here’s the next bite. We already talked about the three industrial wireless bands and what they’re used for. Now, we’ll look at wireless antenna. The antenna’s primary purpose is to focus or direct the signal that it is sending or receiving. The antenna strength, called gain, (measured in decibels) concentrates the transmitter or radio signal in a given direction, and reduces it in unwanted directions. The higher the antenna’s decibel value, the more focused the signal. I’ve found that the word gain sometimes confuses people: they think gain refers to an antenna ADDING power to a radio. That’s actually what an amplifier does. Antenna gain is about concentrating or dispersing radio frequency energy and directing it where it needs to go. By packing that available energy into various patterns, as the different antenna types do, a radio signal can be spread out to a broad field or concentrated into a small tight pattern to go a farther distance. Omni-directional antennas radiate their signal in all directions, like a floor lamp radiates light equally around itself. Semi-directional antennas radiate in a specific direction across a large area, like a spotlight shining on stage. Highly-directional antennas focus their signal on a very specific target, like a laser pointer focusing on a specific portion of a photo. So, let’s take it a step further. Omni-directional antennas (Omni, for short) radiate RF signal in all directions (360°). This antenna type usually has the lowest gain. The small rubber dipole antenna, sometimes called a rubber duck, is the default antenna of most devices, and usually included in the kit price of a wireless transmitter or radio. Indoor installations typically use low-gain omni-directional antennas with gain of about 2.14 dBi. 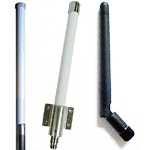 Omni-directional antennas are typically used in point-to-multipoint environments. The omni-directional antenna is connected to a device (like an access point, gateway, or base station) placed at the center of a group of client devices (field transmitters), and provides a central communications point to the surrounding clients. High-gain omni-directional antennas can also be used outdoors to connect multiple buildings together in a point-to-multipoint configuration. A central building would have an omni-directional antenna on its roof, usually a 3-foot or 6-foot fiberglass pole, and the surrounding buildings would have directional antennas aimed at the central building. Semi-directional antennas direct an RF signal in a specific direction, typically in short- to medium-distance communications, up to about two miles. Instead of sending and receiving signals from all directions, they focus their strength in one direction, and are blind to the other. If, for example, your semi-directional antenna is facing East, it will not see or receive the signals coming from west of it. Because it’s more focused than the omni antenna, it can be used to increase signal distance. A Yagi-Uda array antenna, (Yagi, for short) is a semi-directional antenna, used for point-to-point network topology and for point-to-multi-point over long distances. 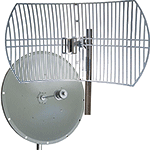 Yagi antenna is made from the array of dipoles (elements) parallel to each other. The first (longest) element in this array is the reflector, next is called the driven element, and additional elements are called directors. The antenna propagates signal in the direction from the reflector to the directors. A Yagi with more directors has a greater gain. If your antenna is going to be exposed to major weather changes or harsh environments, consider ordering one in an enclosure. Highly-directional antennas, like parabolic dish and grid antennas, are strictly used for point-to-point communications, like providing network bridging between two points far away from each other. 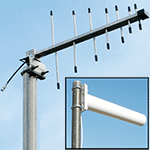 They provide the most focused, narrow beamwidth of any of the antenna types. Because of their high gain, they can be used for long-distance communications, as far as 35 miles. You’ll choose an antenna for its ability to focus signals and send them over a long distance. But as with anything, it’s not that simple. There are a lot of other factors that will influence your decision. The first is line of sight (LOS or LoS on the spec sheets). It’s the unobstructed “view” from one antenna to another. It’s critical to make sure that from the installation point of one antenna that you can see the other. Then, you’ll have to deal with how the radio waves behave. Ideally, the RF signal will move in a straight, direct line from one antenna to the other. In reality, there’s a lot going on between those two locations that will change how the radio waves travel. When it comes to signal strength, the antenna giveth… Mother Nature and the environment taketh away. The radio waves will do one of three things: Go through the stuff between antennas, go around stuff, or be stopped by stuff. Your goal in designing your wireless system is to minimize the effects of stuff that will keep your signal from getting where you want it to go. Loss (also called attenuation): It’s the basic decrease in amplitude or signal strength. Like gain, loss is calculated in decibels, and is caused by a number of things including the electrical impedance of the antenna cable or the use of a lightning suppressor. All cables, connectors, and accessories will have a dB loss value. And, thanks to the basic laws of physics, the RF signal will lose amplitude as a simple function of distance, caused by the natural broadening of the radio waves. I wouldn’t be doing my job if I didn’t say the following: First, the distances and signal strengths of the antenna types are typical, not guaranteed. Performance will depend on your installation and environment. Second, it’s important that someone evaluate the locations and look for potential interruptions in signal strength. In some cases, you’ll be able to purchase the devices and they’ll provide the performance you need. In more complicated cases, you’ll want to get a site survey for help getting the right equipment. During the survey, a trained professional will come to your plant and test for all the factors above: Distance, line of sight, possible obstructions, radio/transmitter/antenna mounting locations, and available power. Then, they’ll map out your site for the right network devices, and help you spec out what’s necessary to get your wireless system operational. There are several reasons why industrial wireless systems fail to live up to expectations, and most are preventable. Not having a site survey prior to installation is one. I’ll write more about the others in an upcoming post. Want to learn more about wireless? Which industrial wireless technology is best for me? Now, it’s your turn: What functions or parts of industrial wireless technology do you want to know more about? What concerns you about trying industrial wireless in your plant or application? This entry was posted on April 11, 2012, 11:28 am and is filed under Communications, Configuration, Cost Issues, Installation, Process terminology, Wireless, Wireless, Wireless Transmitters, wireless transmitters. You can follow any responses to this entry through RSS 2.0. You can leave a response, or trackback from your own site.